Before Jurassic World even begins to get going, we see the familiar E.T. production banner for Steven Spielberg's Amblin Entertainment ride across the screen. Amblin, known mostly for its light-hearted kid-friendly adventures of the '80s and '90s, pretty much defined how most people look at that particular genre of film. 1993's Jurassic Park took that to a whole new level, inspiring awe and wonder in the middle of a deadly thriller. While subsequent sequels may have dropped the ball, the first film got the tone just right. 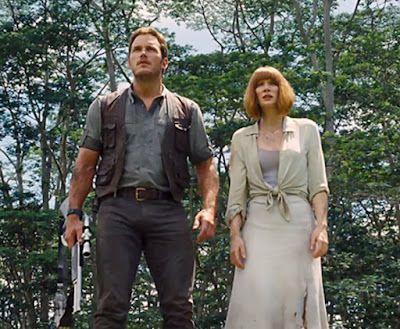 Jurassic World, which takes us to even greater dino-theatrics than before, captures the magic of Jurassic Park while employing a whole new bag of tricks to stand firmly on its own. 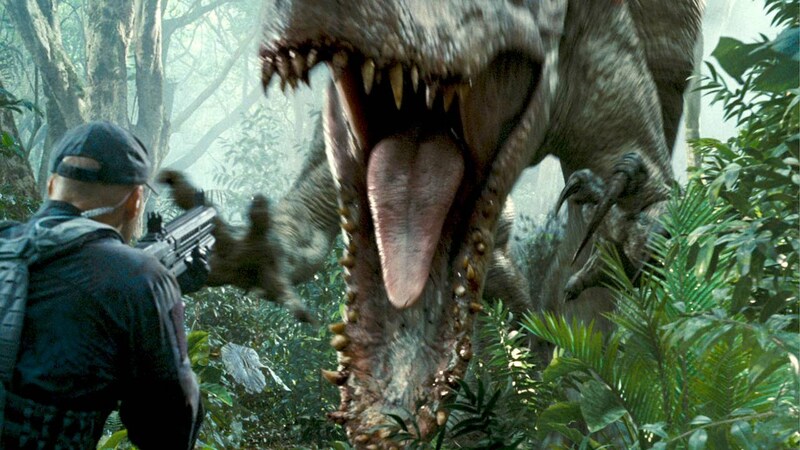 Directed with surprising blockbuster-sized chops by indie filmmaker Colin Trevorrow (Safety Not Guaranteed), Jurassic World is at times terrifying and wondrous, yet never stops being just plain fun. No small task given the franchise's rich backstory, which Trevorrow and co-writer Derek Connolly (along with Amanda Silver and Rick Jaffa) weave in seamlessly without bogging us down in details. Twenty-two years have passed and now Jurassic Park is fully operational on the isolated Isla Nublar, and has been running disaster free for years. But this being such a huge corporate venture, the need to create bigger, flashier, more dangerous dinosaurs is constant. 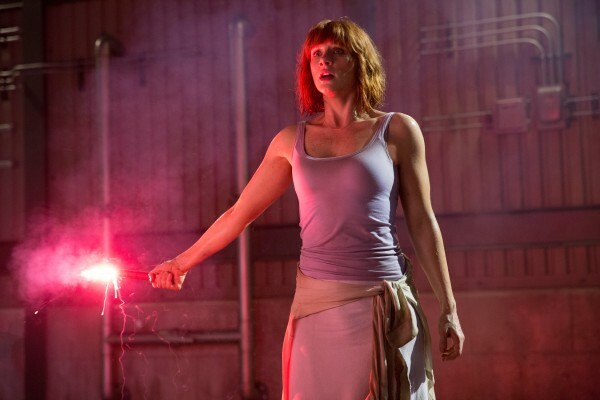 Audience interest needs to be "refreshed", or so we're told by strict operations manager Claire Dearing (Bryce Dallas Howard), putting the needs of corporate shareholders over more immediate concerns like safety and morality. In pursuit of these greater profits, the team of geneticists led by Dr. Wu (the returning B.D. Wong) has taken to splicing together hybrid dinosaurs to create something new. This isn't exactly a new idea as the first wave of created dinosaurs used DNA from other creatures...but how did that turn out last time? Not so well, and we know it won't turn out so well here, either. 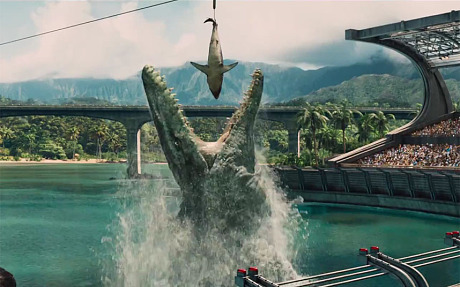 Their greatest triumph, the 50-foot-tall Indominus Rex, is a gigantic killing machine with the traits of a Tyrannosaurus Rex and other unknown (at first, anyway) creatures. It's meant to be their biggest draw. It will turn out to be something far worse. We don't have long to wait before the Indominus breaks free and is loose upon the park, which we would call an utter disaster but they blandly call a "containment anomaly". Can't scare away the public! And it's that sanitized corporate nature that proves to be the greatest threat in Jurassic World; well, that and our insatiable need to play God. Chris Pratt, more action hero-y than ever, plays Owen Gracy, an ex-Marine now an animal behaviorist who trains velociraptors. What for? Who knows; but he's formed a bond with four of them (naming one "Blue", which is like naming a Gremlin "Stripe"), becoming their “alpha male”. 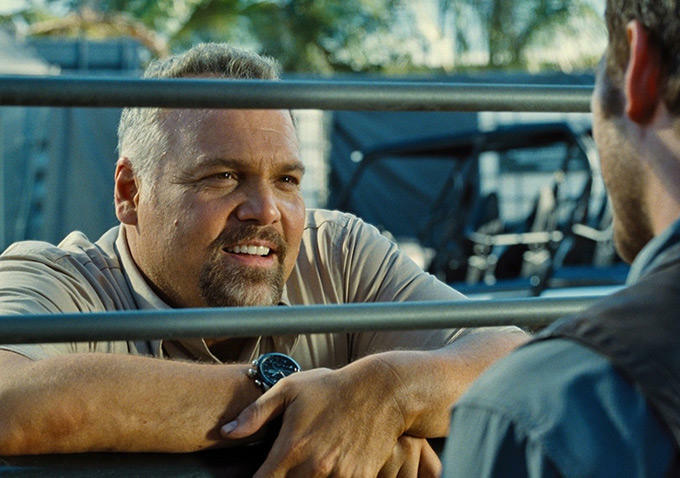 That's piqued the interest of an evil military contractor (all military contractors are evil in movies) played by Vincent D'Onofrio, who hopes to make a profit using them as weapons. When the crap hits the fan he sees it as an opportunity for a field test rather than a "holy sh*t"-level disaster. Unfortunately, the day all of this goes down is the same day Claire's nephews Zack (Nick Robinson) and Gray (Ty Simpkins), who she hasn't seen in years, are visiting the park. Trevorrow clearly has affection for the original film, but at no point do we sense that he is a slave to it. There are some moments that feel like vague homages; the trembling ground with every stomp of the Rex's feet, or a scene in which visitors are surrounded by stampedes of herding dinosaurs. One moment in particular that recalls Jurassic Park involves a dying herbivore, slaughtered by the Rex for sport. It also happens to be the film's most touching moment. As Pratt's Grady points out; these creatures don't realize they were bred in a lab somewhere; their natural instincts remain. Some just want to live while others only have the urge to kill. 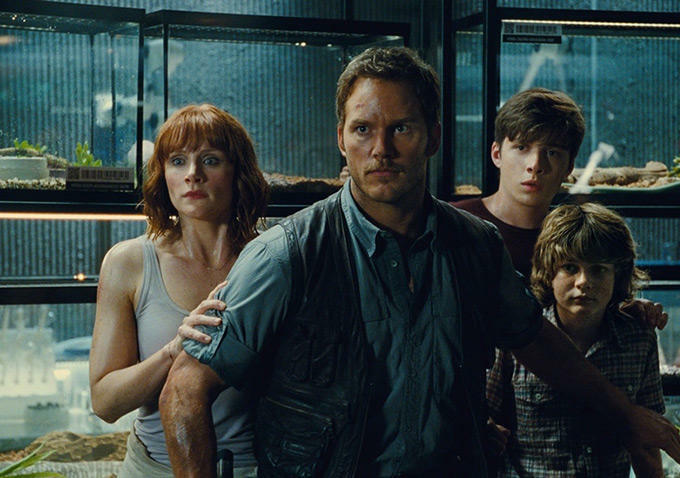 So you've got complicated family dynamics, kids in danger, romantic entanglements, corporate malfeasance, and Godzilla-sized chaos all going on at the same time, yet Jurassic World never feels overstuffed. In fact it breezes along nicely and the action sequences are thrilling and often jaw-dropping. While not the technical breakthrough Jurassic Park was, there's still something astonishing about the sight of a thousand pterodactyls flying overhead and attacking the defenseless crowds (look out for funny cameos at this point), just as it's chilling to see a mammoth Tyrannosaurus Rex charging into battle against a foe of equal stature. Basically, the film looks great, the score is spot-on, and the cast does a terrific job of making you care about the characters. Pratt is the obvious centerpiece here as the Sam Neil-esque hero, and Howard makes the best out of a slightly underwritten role. Irrfan Khan is predictably good as CEO Simon Misrani, the spiritual and literal successor to park founder John Hammond, while Jake Johnson, Judy Greer, and Omar Sy provide laughs and a few dramatic touches. This is definitely a scarier movie than prior efforts, though, and parents may be forced to shield their kids' eyes when they aren't covering their own! Jurassic World had a tall order ahead of it, but with engaging drama and enough excitement to rattle the raptor cages, it works as a worthy companion to Jurassic Park.